IDENTIFICATION: Black with reddish –orange on the head, sides of the pronotum and wing covers. The colorful bugs have Y-shaped head markings and crossing orange bands across the wings. They have long sucking mouth parts. BIOLOGY AND LIFE CYCLE: Incomplete metamorphosis. Eggs hatch in about 1 week, take about a month to become adults after 5 nymphal instars. Nymphs have bright red abdomens and look like adults without full wings. Adults mate end to end. HABITAT: Found in small groups on milkweed plants, often under leaves. FEEDING HABITS: Milkweed bugs pierce the walls of seed pods to feed on the seeds. They also eat the green tissue of the plant. 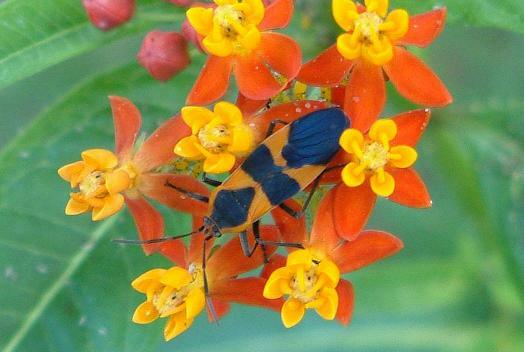 ECONOMIC IMPORTANCE: This insect can tolerate the toxic compounds in milkweed plants. They are important in regulating this plant as a weed. They are pests if you are trying to raise milkweed plants for butterflies. NATURAL CONTROL: They have few predators because they taste bad due to the compounds found in milkweed plants. These bugs use their bright colors to advertise their bad taste. Limit milkweed plantings. ORGANIC CONTROL: Plant oil sprays and neem products. INSIGHT: The small milkweed bug is Lygaeus kalmii.